Fishing trips, tricks, and reports from the Gunflint Trail, the Boundary Waters Canoe Area Wilderness, and Quetico Provincial Park. Check out our tips on fishing in the BWCA. First things first, let’s just clear the air by stating that the following blog post is not exclusively about taking your girlfriend ice fishing. It’s about taking your girlfriend, boyfriend, best friend, or any other slightly reluctant adult ice fishing for the first time. We were simply inspired by the recent video on Jay Siemens’ Youtube channel about “What NOT to do when you take your girlfriend ice fishing.” This is not a gender specific post. Whew! Moving on . . . .
As a girlfriend who has been taken ice fishing, I have a little insight on this subject. I went ice fishing a grand total of once as a child (it was cold, we caught one fish) and it wasn’t until I was in my mid-twenties that ice fishing became a regular winter activity for me. Since I wasn’t raised by anglers, I’m not sure I could have really explained what a tip-up was on that first “grown-up” ice fishing trip, so the ball was firmly in the court of the person taking me ice fishing to show me it was an experience worth repeating. Luckily, Andy was up to the challenge, and while I might not always be the most cheerful ice fishing companion (see photo below), for the last decade, I’ve accompanied Andy ice fishing on a fairly regular basis. The tips we go over in last year’s “The Best Ice Fishing Lakes for Kids” post are as applicable to adult first-timers as they are to kids. For that first ice fishing trip with your would-be IFFF, you want to choose a lake that you’re confident can deliver fast results. We know you’re excited to take your significant other out fishing, but now’s not the time to take them out to that one lake you need to bushwhack into that you’ve heard good things about but you’ve never actually fished. Take them to a lake you know well and to a spot that consistently delivers. Here’s a scenario for you. Let’s say your significant other is really into running. You’ve watched them lace up their shoes religiously every other day, you’ve cheered them on at countless 5ks, and now they’re training for their first marathon. You’ve never run a mile, but you’re inspired. You mention in passing that you’d like to go running with them some time. They take you up on your offer and invite you along on their next run. Now are you more likely to going running with them a second time if they A) take you out on a five-mile tempo run with no water breaks or if they B) take you on a leisurely run/walk option around a couple blocks? One of the best things you can do is rig up your partner’s rod with whatever tackle and bait you think works best for where you’re fishing and then letting them have at it. Maybe their jigging technique makes you cringe. Maybe you’re 100% sure they’re not dropping their line deep enough. Be conservative in how much advice you volunteer and don’t feel the need to coach them through every step. Sure, they might lose a couple fish on their way up to the hole before they totally get how to set the hook and keep tension on the line, but if they care, they will learn. If they don’t care, they’re not listening to you anyway, so save your breath. Let them ask the questions that will help them become better anglers and be okay with the fact that their techniques might differ from yours. Your way or the highway is not a good approach to ice fishing . . . or your relationship. Remember, they’re not going to come with you again if they don’t have any fun, so you might have to let go of a little fishing hubris. Don’t get caught up in fishing ultimatums that you might hold yourself to if you were fishing alone. This is not the time to declare “we never pack up until a full half hour after sunset” or “nobody goes anywhere until one of us catches a 10 lb trout.” Maybe you never keep fish, but your fishing partner is pretty keen to take the fish they just landed home for dinner. Let them! It’s supposed to be fun. While this is a gender specific tip, there’s no getting around the fact that toileting in the woods is more of an ordeal for women, especially when bundled up for winter weather. If you happen to be a male taking a female ice fishing off the Gunflint Trail for the first time, it’s a nice gesture to select a fishing area that’s close to a Boundary Waters campsite so they can use the latrine if they prefer. 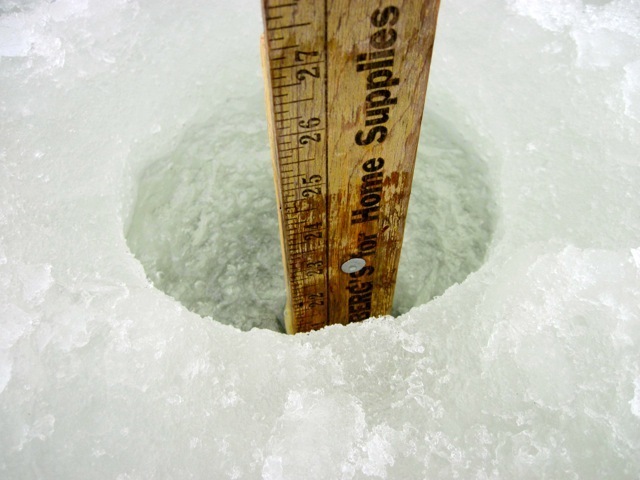 You might be anxious to get out ice fishing as soon as the ice is safe, but if you’re looking to cultivate an IFFF, you might consider waiting to take that first ice fishing trip together until mid to late March. 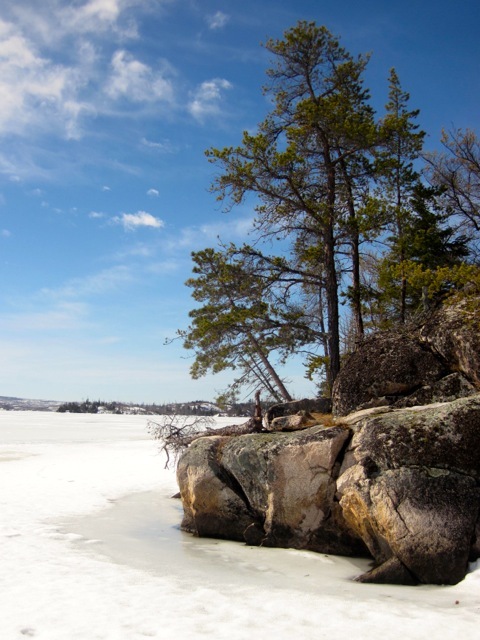 Along the Gunflint Trail, late March is the best time to go ice fishing because the longer, sunnier days knock down the snow and slush to make for easy lake travel and after the long winter, ice fishing in sunny 40 degree weather feels downright tropical and fantastic. Besides, nothing builds anticipation like having one great ice fishing trip in late March and then not being able to go again for another nine months. If this is the first time your partner has gone ice fishing, they might not know what kind of outdoor clothing they need to be comfortable ice fishing, or they just straight up might not own the right clothing. To avoid your partner getting literal cold feet, throw in some hand and feet warmers, an extra jacket or vest, a balaclava, and an extra pair of mittens. A hot thermos of coffee or hot cocoa to share is a good way to warm up and pass the slow time when the fish aren’t biting. Don’t forget some snacks! We spend most of our free time in the first three months of each year ice fishing for lake trout. Because our business keeps us busy all summer long, in any given year, we spend considerably more time fishing in “hard water” conditions than we do on open water. Ice fishing can seem a little daunting. For one thing, it can be downright chilly and people are sometimes apprehensive to invest in the specific gear needed for ice fishing. But while you might have to work a little harder to succeed at ice fishing, that just makes the experience all the more rewarding. 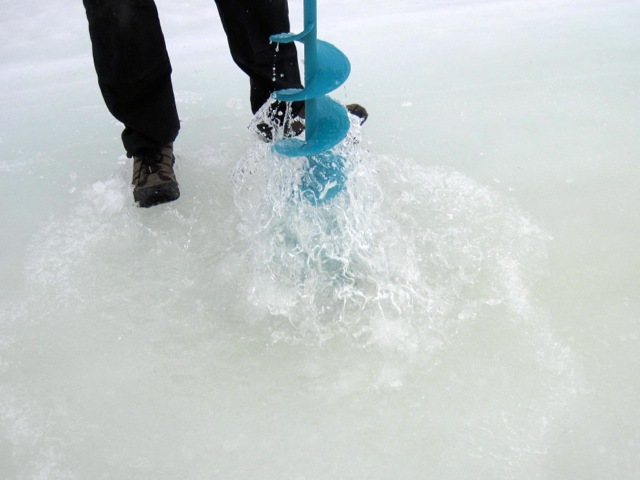 The specialized gear needed is limited to a few rods, ice scoops, and augers. Best of all, ice fishing is a great excuse to spend sometime outdoors in the winter months, even if you come home empty handed. 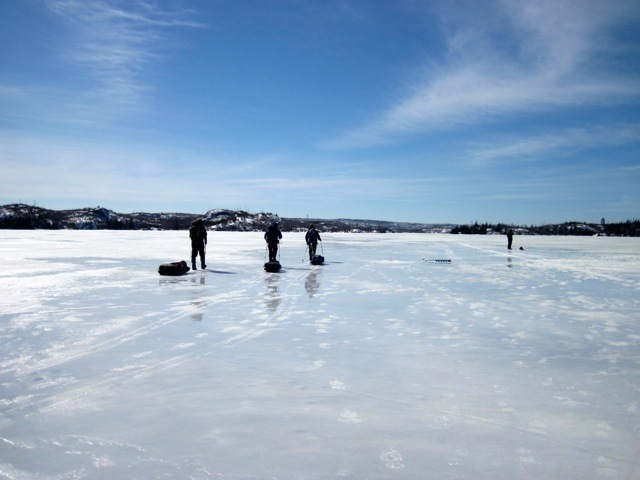 Throughout the year, we hear a lot of questions from those curious about trying their hand at ice fishing. What’s your favorite lure? What’s the best hand auger? Why don’t you use a sled to haul your gear? To answer all those questions and more, Andy put together this ice fishing gear video tutorial. Don’t worry, you don’t need to make a list of all the gear Andy mentions in the video. Just use our printable ice fishing packing list as an easy reference point when you pack for your next ice fishing adventure in the Boundary Waters Canoe Area Wilderness. 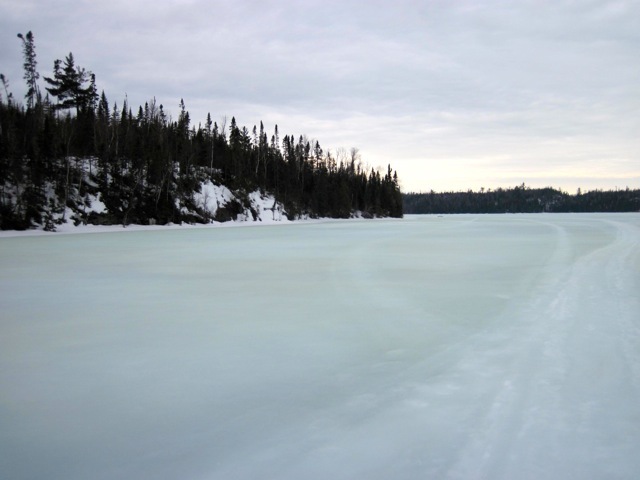 The DNR’s Lake Finder website is a great resource to guide you in choosing a Gunflint Trail lake to ice fish on. You can always give us a shout at 218-388-2221 for lake recommendations too.